Well I have, and often. I’m smack bang in the middle of a busy summer at work, sick of looking at smelly noisy planes, not cycling enough (mainly due to a recent knee infection) not camping enough and desperately missing the outdoors and having time to be lost in my own thoughts. Though I try to do a S24O (sub 24hr overnighter) at least once a month in the summer to keep my sanity I’ve only done two this summer. There is also a downside to a S24O, it goes past too quick and the prep, unpacking and gear drying costs more time than most would like to admit. 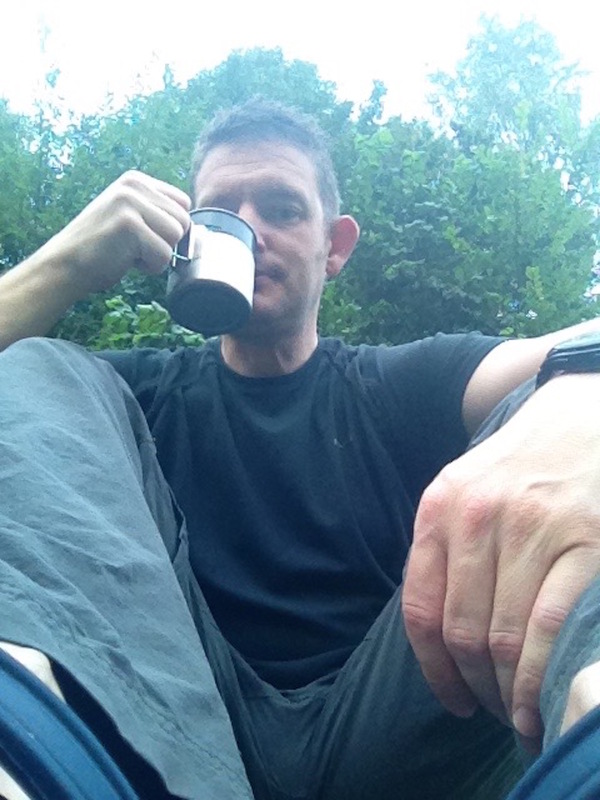 My S24O’s also tend to focus on the camping aspect and being outdoors and less on the cycling ( I usually only cycle and hour or two to one of the quiet campsites nearby). I set myself a 48 hour Ride, Eat, Sleep challenge. If you’re now expecting a story of cycling to the early hours in the morning sleeping 2 hours at the side of the road then continuing, guess again, I like and need my beauty sleep especially after a 6 day week. No words can explain the feeling that comes with the sound of an alarm clock at 1315. I often just want to cry or roll over. The 4.5 hours sleep that morning brought me to about 16 hours sleep in 3 days, and all that was disturbed daytime sleep. Nightshifts will never be a hobby of mine, but it pays the bills. My days off after nights I’m more likely to be found on the couch feeling sorry for myself than cycling huge distances. Naturally I pressed snooze, and again, the only thing that stopped me rolling over and sleeping the rest of the day was the thought that I’d dared myself to do a 48 hour Ride, Eat, Sleep challenge and just for once I was organised and my bike was packed and ready to go, all I needed to do was shower, drink coffee and go. Fast forward to an hour after my planned departure time, I was finally going out of the front door. After the knee issues of the last month it was quite realistic that I’d be home again in an hour. The initial muscle and tendon pain around my knee was gone within 20 minutes and much to my relief it was obviously game on. Wild camping is possible in The Netherlands but it’s not always easy to find a good spot. But, there are a couple of websites/clubs that offer quiet sites for under €10 so I had no intension of being difficult and just planned an option a,b,c for that day depending how far I got, 2 out of the 3 were sites I know. As luck would have it and despite of the headwind and the last weeks at work, the fresh air and hypnotic turning of the pedals did wonders for my mind and body. Before I knew it I was getting lost around Hilversum which was past my plan a. I hid during a short rain shower in a snack bar and uncharacteristically ate the crap they where serving, it saves me cooking later was a great excuse to eat chips. On the road again I was able to laugh at the irony of city slickers escaping the traffic jams for a boating holiday, only to get stuck in a boat jam. An hour later after several wrong turns I crossed into Flevoland. By now my lack of sleep and training was starting to show, and my legs started to complain. Luckily by now I know roughly how much I can push my legs and figured the last 20 or so kilometers to plan b would be do-able, and plan c would be impossible. A detour to a supermarket was now out of the question, maybe tea before bed instead of beer wouldn’t be a bad thing as preparation for tomorrow? 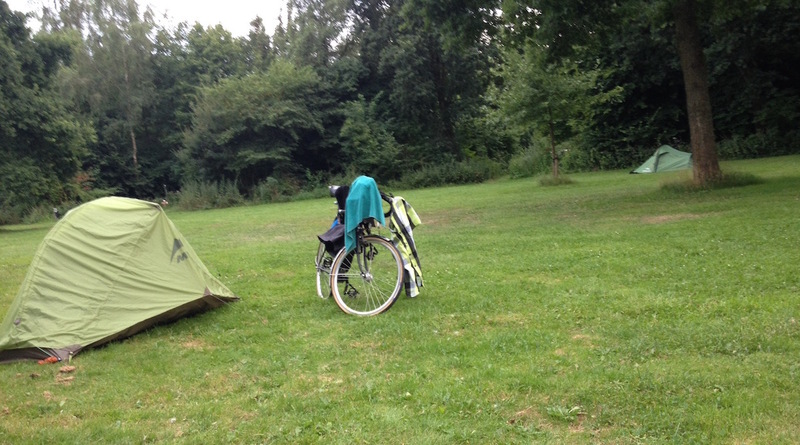 I arrived at the surprisingly quiet campsite at 8pm after exactly 100km. Shower, tea, bed. I thought I’d read for half an hour before sleeping, after all I’d only been awake for 8 hours. Though Tom’s book about running across America is a great read, I was gone by the 3rd line. To be woken by sun rays shining through the tent door is certainly one of the pleasures in life I miss now I’m not on the road full time. What a wonderful way to start the day. The 8 hours sleep had done wonders (did I mention I like my sleep) Missing the supermarket the previous evening meant I was on the road less than an hour later after a breakfast of tea and nuts. 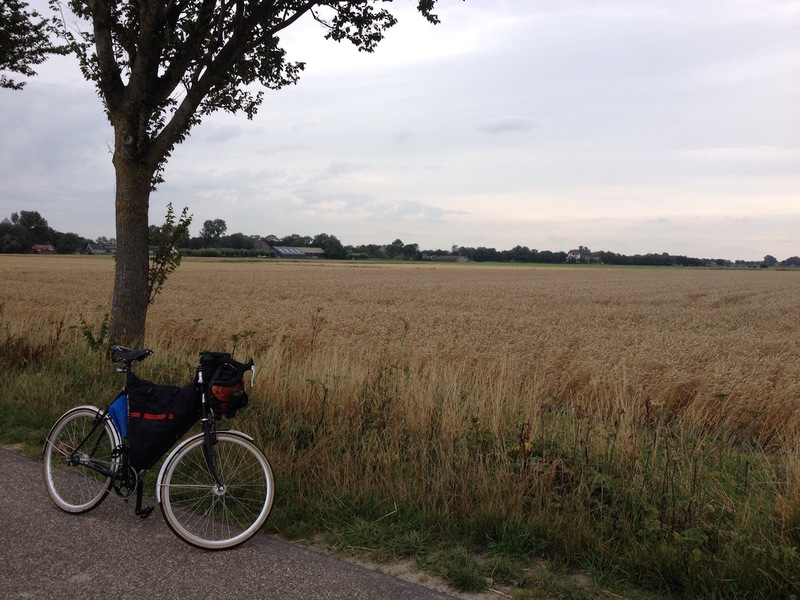 The Flevopolder like any other polder is generally uninspiring to cycle unless you like looking at flat farmland. A friend of mine once said you can tell it was planned in the 70’s/80’s as the tree’s are spaced at pixel intervals on an 80’s computer screen. I popped into the uninspiring town of Dronten to find a supermarket for second breakfast and lunch, I’d hoped to stop at a cafe for something to eat, But in the Netherlands nothing much is open on a Monday morning. I pedalled on for another hour then had lunch and “rested my eyes” for 20 minutes. 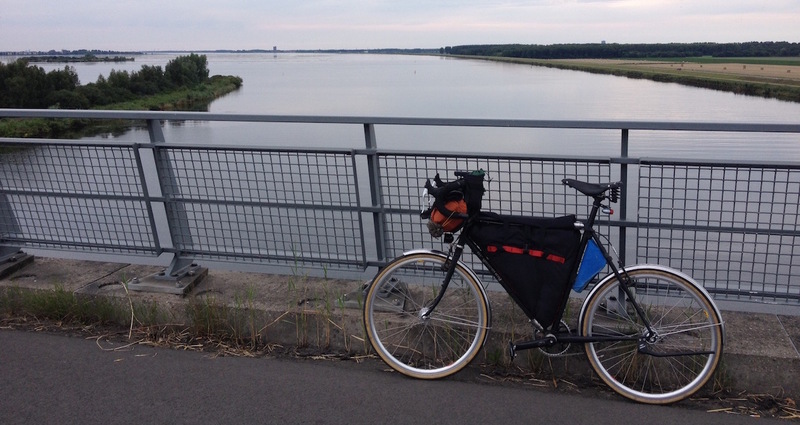 I carried on North along the banks of the IJsselmeer, enjoyed the only couple of hours tailwind I would have during the whole trip. In Lemmer it was decision time during second lunch. I was approaching my option a and b for that day but was still feeling good, and appreciated that if I stopped at option a or b then the 150km back home the next day before my self induced cut off of 3pm would be almost impossible. And there I was, at the afsluit dijk. Depending on your opinion and the wind direction its either a wonder of modern engineering or 32km of hell. After 140km that day on a single speed bike, for me it was the latter, and the extra apple pie in Zurich didn’t help. I arrived in Den oever two hours later pretty broken, and unable to find the supermarket, I guess it was one of the many boarded up bankrupt buildings that certainly don’t improve the look of this once prospering fishing village. But as a saving grace they had a snack bar, and after another sate and chips I was able to push on for the last 10km to my ambitious plan c for the day. 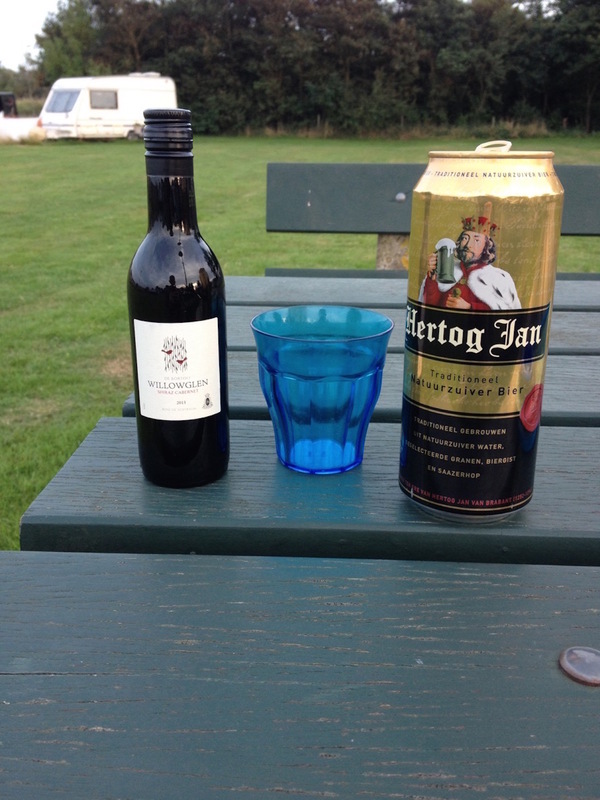 By now I was desperate for a celebratory beer after my second longest day cycling ever….I didn’t dare stop at one of the pubs I passed, thinking I might crash and burn after one beer. But in a stroke of luck I stumbled on a supermarket only 3 km’s from the campsite minutes before closing time. Half an hour later I was showered, relaxed and ready for a nightcap. I’d been on the road 12 hours and cycle 180km. My arse felt like an S+M session without a safety word. I once again slept like a baby. I woke 8 hours later (did I mention I like my sleep) thinking I was back in Africa, its not often in Europe that you get melted out of your tent in the morning. I took a super slow start and enjoyed the boiled eggs from the farm next door. Despite the previous day I was impressed at how well my legs were feeling, and cycled like a crazy man. More wrong turns, polders, sleepy villages and headwind and only 1.5 hours after my 3pm cut off I was home. I’m now thoroughly broken and very happy for the experience of pushing myself to my limits on home turf. Even more important my mind and personal inspiration is restored after 50 hours only thinking about riding and food. I’d recommend a 48 hour Ride, Eat, Sleep challenge to anyone. 12 hours from now my alarm goes again, this time at 6am instead of 1315. Though I’m not an advocate of rushing cycle touring, or pushing too hard, this was just what I needed, cycling ever kilometer I had in me and getting 8 hours sleep a night. Mission accomplished! Good for you! Loved the read. 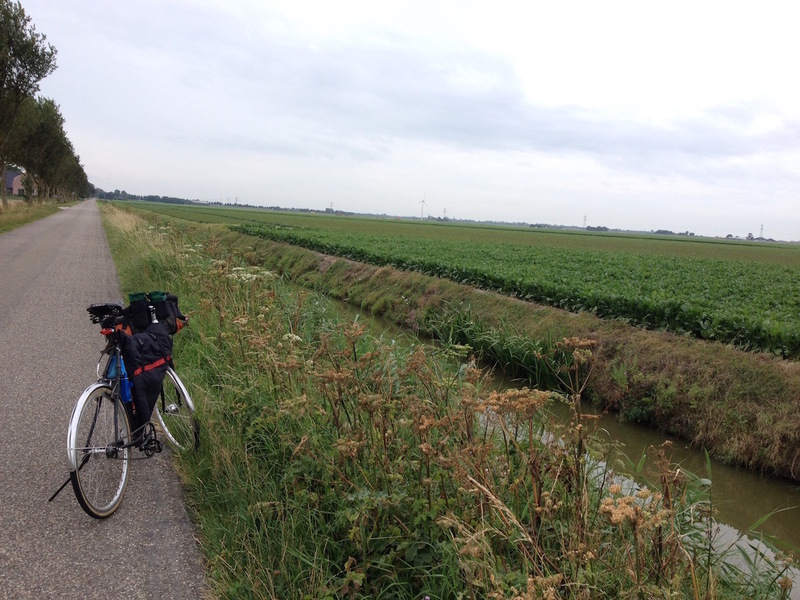 As many dutch would say, you cycled the typical dutch landscape… But none of us ever did so, not in your fashion. Great read Shane. I could use one of those “thoroughly broken” 48 hour Ride Eat Sleep challenges right about now, to break away from all the societal norms. Your cost of 49.5 euros is amazing.